Childproofing the home most often involves baby gates at stairwells, locking cabinets, and covering electrical outlets. However, securing windows to prevent falls is chronically overlooked. Window screens are not enough. Children must be protected by installing window guards designed to be removed quickly in case of fire. NEW: Introducing Stainless Steel construction on select sizes. The Guardian Angel® Window Guard is a set of removable steel bars designed to prevent children from falling out of windows. Children have an eager desire to explore their surroundings. Sometimes this curiosity leads to dangerous situations. 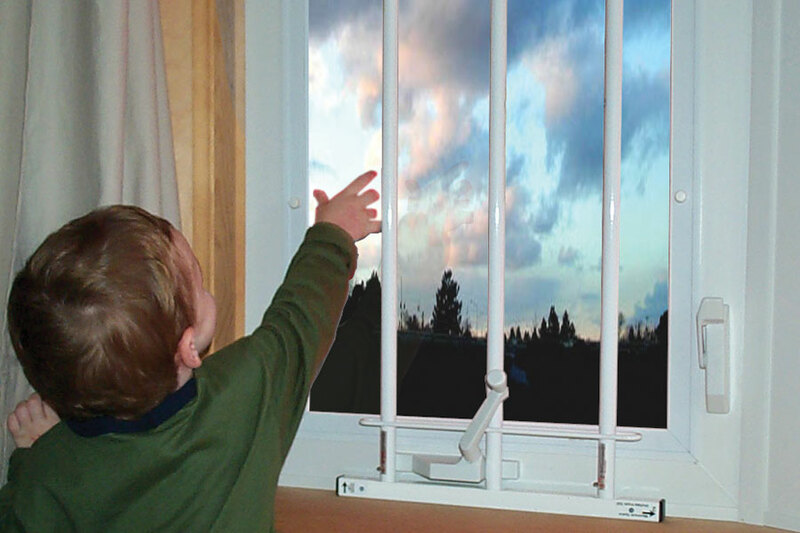 A child leaning against a window screen to see better outside is not unimaginable. The window screen will not keep a child safe from a fall. The Guardian Angel Window Guard is made to protect children from these harmful moments and to give parents peace of mind that a tragic window fall will not occur in their home. Telescoping bars allow guard to fit various window widths or heights. Constructed of durable steel that can withstand the weight of a child. Quick-release buttons allow for removal in case of an emergency. Hardware mounting ensures guard is installed securely over your window. See the Guardian Angel Window Guard in action. View this product demo and learn what distinguishes the Guardian Angel Window Guard from its competitors. Fits most styles of windows including single/double hung, sliders, and casements. Easily installs with just a screwdriver or drill. Available in a glossy white, high-quality finish. The Guardian Angel Window Guard is manufactured and assembled in the U.S.A. and complies with the ASTM F 2090-13 Standard for Window Fall Prevention Devices with Emergency Escape Release Mechanisms. Automatic Specialties has been manufacturing custom wire and metal products for over 40 years. We are strongly committed to providing a top-quality product. Our dedication to quality combined with our extensive manufacturing experience has allowed us to provide parents with a product they can trust to ensure the safety of their children.